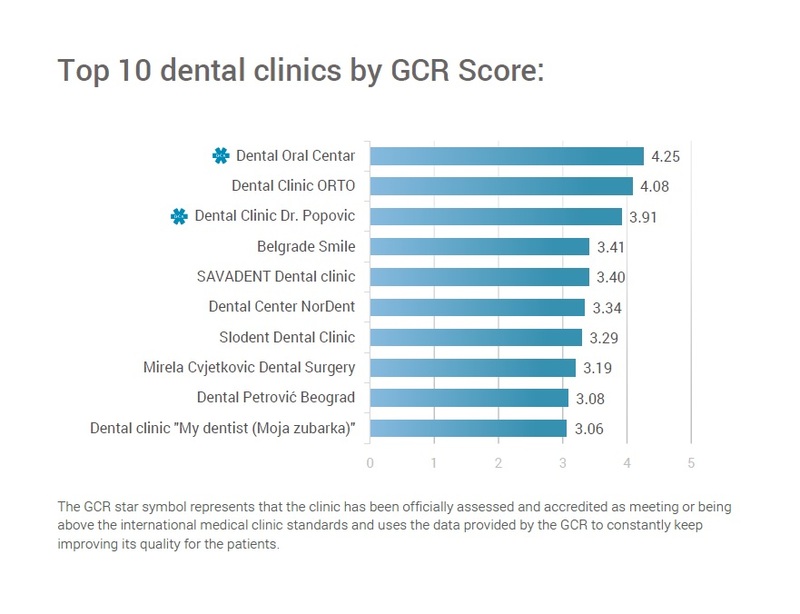 According to the GCR’s latest analysis of Best Dental Clinics 2018 in Serbia, Dental Oral Centar ranks as the leading clinic in Serbia, when it comes to overall international clinic reputation. A total of 92 dental clinics were included in the study. The average GCR dental clinic quality score was 2.95. This demonstrates the huge range of rising healthcare standards available in the country. The GCR – Global Clinic Rating, the leading provider of healthcare clinic ratings worldwide. It aggregated and analyzed dental clinics throughout Serbia during 2018 including dental clinics in Belgrade, Subotica, Niš, Novi Sad and others. Dental clinics were ranked according to their GCR Score, against other clinics in the same country on the level of apparent expertise, services, facilities and patient outcomes available by the clinic. The GCR feedback score for the clinics includes patient rating scores from Google & Facebook and other independent rating providers. Dental Oral Centar ranked #1 with a GCR Score of 4.25 and ranks in the Top 50 from 126,000 dental clinics monitored worldwide. Furthermore, followed by the Dental Clinic ORTO (4.08) and the Dental Clinic Dr Popovic (3.91). It’s important to point out that the GCR Scores may change daily. It depends on what has been recently changed within clinics’ expertise, facilities, services and patient feedback. Every little change in clinic’s profile can affect the overall GCR Score of that particular clinic. While the Serbian healthcare system may still be struggling, facilities for overseas visitors are top quality. Healthcare tourism is still in its infancy in Serbia, but it is growing rapidly, with expanding facilities to match including clinics for cosmetic surgery, dentistry, fertility treatment and weight loss procedures. Download the GCR’s full report – SERBIA: Best Dental Clinics in 2018 (English Speaking) to discover the names of the other dental clinics that made it to the Top 10 dental clinic list in Serbia and to find some brief statistics of these clinics. Dental Guide: How to choose a dentist abroad?